The smart grid ‘network of networks’ claim adds another contender. Behind both announcements is Proximetry’s AirSynch platform, software that ties multiple smart grid networks -- smart meters, distribution automation, demand response, SCADA systems and the like -- into one view. In other words, it’s the smart grid network of networks, writ large. This is going to be a huge growth area in the smart grid this year, with companies like Telcordia, SK Telecom (via its GridMaven U.S. subsidiary) and Cisco launching new platforms so far, and more no doubt on the way. With its announcement, Proximetry would appear to have a seat at the table as well. Proximetry was founded in 2005 and has been backed by Munich Venture Partners, Aeris Capital, Investec, and Rembrandt Venture Partners. It raised a $5 million Series A round in 2007 and in June raised $792,000 of a planned $1.08 million round, according to a regulatory filing. It has also won grants from European government entities (PDF), and has offices in Poland and Germany. 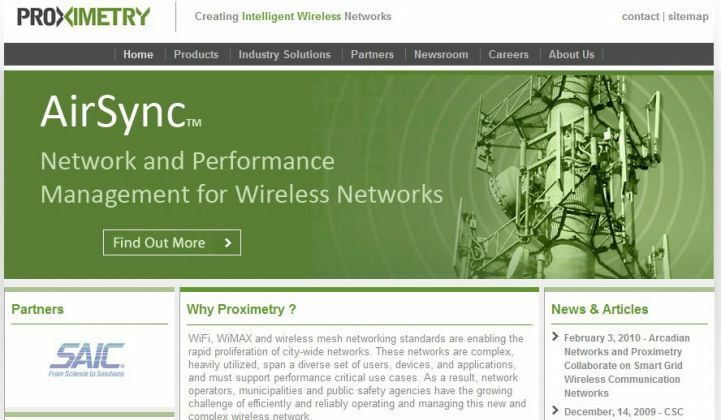 Proximetry claimed more than 200 deployed customers around the world as of September, and claims partners that include SAIC, CA, Boeing, RuggedCom, AirTegrity, Celergy Networks, SYS Technologies and Thales (PDF). That list includes a lot of network security expertise -- an increasingly important issue for the smart grid. While it hasn’t named any utility customers, it’s quite possible that some of them are also Cisco customers. Monday’s announcement states that AirSync is built into Cisco’s Field Area Network GridBlocks architecture, part of the expanded networking push that Cisco is making with smart meter partner Itron. That’s a new platform, but the announcement also notes that it represents an extension of Cisco and Proximetry’s work together, though it doesn’t specify just where else they may be connected. One big question is whether Proximetry is playing a role in the network management system that Cisco announced last week. What about Proximetry’s cloud computing project? CSC’s announcement describes it as network management for multi-vendor, multi-radio (LTE, WiMax, Wi-Fi, 4G) public and private networks, all hosted in CSC’s cloud data centers. The offering is set to launch later in 2012, though the two companies didn’t announce any customers in their Friday release. Proximetry’s move to cloud computing matches a trend in the smart grid industry, away from putting the IT burden on utilities and toward shifting it back to vendors. Cloud computing has been a fairly common way to manage today’s smart grid deployments in practice, but now companies as varied as Silver Spring Networks, Tendril, Honeywell, Lockheed Martin, IBM, Oracle, Cisco, Verizon and eMeter and others are making a business proposition out of it. CSC has been touting its “Smart Utility” framework to link utility enterprise IT systems to legacy operations networks like SCADA for some time. How it works with Proximetry to bring their combined cloud network management service platform to market remains an open question. Often enough, clouds work with clouds. Take the Aclara-Calico Energy partnership announced last week, which is offering a cloud-based demand response platform for small utilities, one that connects with Digi International’s cloud platform for managing networked devices. Cisco has multiple services nested within its overall smart grid platform, and may well enlist its enterprise cloud computing platform to manage it all. Proximetry has been relatively quiet about its plans until now, but expect that to change this week. Andres Carvallo, the former Austin Energy smart grid guru who left startup Grid Net to join Proximetry in May, will be talking about the startup at this week’s DistribuTECH conference in San Antonio, Texas, including an appearance with Cisco representatives. Stay tuned for more details.